The Vampire, by Phillip Burne-Jones (1897). They are, arguably, the most visceral manifestations of our deepest nocturnal anxieties; pale-skinned, fanged denizens of the undead realms that awaken under cover of darkness, shrouded by shadow and lured by the warm pulse of blood that thrums through human veins. 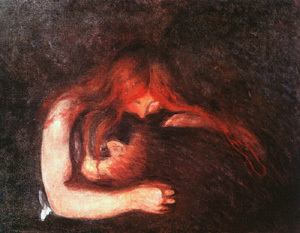 The veiled myths and horrifying legends of the vampire are as old as the first roots of civilisation – folklore and superstition the world over recognising these strange creatures, once alive but now condemned to walk the earth with human life as their only sustenance, preying on the innocent even as they laid their heads down and succumbed to sleep. However, it was not until the early 19th century, and the first appearance of the vampire in modern literature, that the image of what we instantly recognise as suave, bloodsucking aristocrats truly came to be. 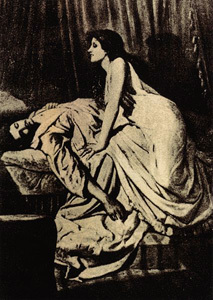 It was only with the publication of The Vampyre by John Polidori in 1819, truly the first literary representation of the bloodsucking undead to be recognised by the public, even before Bram Stoker’s far more famous interpretation of the notorious Count Dracula, that the modern form of the vampire began to take shape. No longer ghoulish and dark, hideous creatures with insatiable, bloodlusting appetites, but rather well-dressed and refined ladies and gentlemen, full of charisma and wide appeal, the better to lure their unwitting victims. This is the face of the vampire that still endures in modern culture, constantly gaining new popularity in not only literature, but also movies and television. To modern ideals and devoted occultists, the vampire is a seductive individual – capable of glamouring the unwitting and draining them dry. Dark and enigmatic as these walkers of the night are, there is no doubt that their gothic appeal still intrigues and alarms us; alluring figures of pure nightmare, mysterious, inherently dangerous. Tales of vampires and the sanguine destruction they wreaked date as far back as ancient Persia, Greek and Rome; whispers of demons who transformed themselves into beautiful women and seduced mortal men as well as young children; feasting on their flesh and blood before the sun rose. However, the majority of vampiric belief arose in the heart of Eastern Europe. During the 18th century, a sudden rise in the number of citizens dying from loss of blood led to Slavic governments actively seeking out and staking those they believed to be vampires. 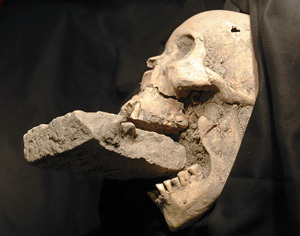 Even the corpses of the recently deceased, bloated and decomposing, were reburied in shackles of metal and even with bricks jammed into their jaws, for fear that they would rise again and attempt to seek out another unearthly meal. 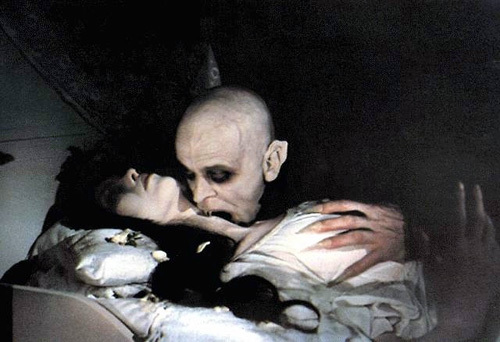 Eventually, this terrifying superstition and the panic it caused crawled its way into the consciousness of Western Europe – the Greek vrykolakas and the Serbian vampir being translated into the vampire as we understand it today. Skull of an exorcised vampiress, found near Venice, Italy..
Frances Dade and Bela Lugosi in Dracula, 1931. A scene from Nosferatu, 1922; Graf Orlok prepares to consume his prey.